The two doors at the ends of the container simplify the placement and fixation of goods greatly, but increase the cost. With their external dimensions, internal volume and payload, such containers are completely identical to dry containers DC. To identify them the notation DD (Double Door) is used. The most used 10-foot containers are in better condition than used of full-size. This is due to the fact that because of the twice reduced in size, compared to 20-foot, they are much more rigid. In addition, they are rarely damaged because of improper cargo placement or fixing. High quality of 20-foot containers produced for sea transportation is generally admitted, but the necessity to load containers to the maximum required increasing its height. To buy used 20HC container, a little increased in the height, is possibleto use for its intended purpose or as a reliable metal construction. Standard width for sea containers, regardless of length, is considered 2483 mm, which corresponds to 8 feet. But for the rational cargo transportation and use of container volume the need to use containers of different height appeared. Freight SIDE DOOR containers have one or two additional doors along the long side. They got the designation OS (OpenSide) or of similar meaning SD (SideDoor). Despite the higher cost of this type of containers, they are at demand for multimodal transportation. In operation containers fail to meet the stringent requirements for sea transportation, which leads to decomission. Normally, they can be used for railway and road transportation for long, as well as be applied for other purposes. 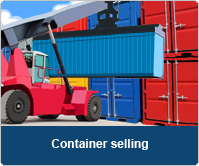 It is possible to buy a used container of 20 feet at prices different in times due to their condition and location. Proftrans company offers to buy a used sea 30-foot container to apply for its intended purposeto car and railway carriers and cargo owners. The buyer has the opportunity to purchase a reliable container for anyland transportation which ensures protection of goods from external influencesat a fair price, depending on the condition of the container. Used 30-foot containers are available in standard and extended height (30HC and 30HQ). Despite the fact that most shipping containers have lengths 20 and 40 feet, and all ships and port mechanisms are designed for them, life requires the application of 30-foot containers also. ISO 668-1995(E) permits their production with different height and width. For the standard sizes the length and width of the shipping container of 8 feet were adopted due to the adaptability of the port infrastructure to these dimensions. ISO standards allow the production of containers of different length, not only of standard cross section 8x8 feet, but also with significantly increased volume due to the change in height. High containers are assigned the designation HC (from the English High Cube), that means "increased volume". Abbreviation HQ having the same meaning is less common used. Used sea containers of 40 feet, the sale of which is carried out by Proftrans Company on the territory of Russia, can be used for transportation of goods and as universal constructions. As a response to the necessity to transport bulky loads, the containers with increased height appeared. You need to consider that the payload (P) of standard high 20-foot and 40-foot containers are almost the same. Thus, new 40HC, the cost of which differs slightly from different manufacturers, has more than doubled volume. Despite high reliability and durability of 40-foot containers, they are gradually losing their performance. Typically, failure occurs due to improper fixing or external mechanical impact during transportation. If they are impossible to be repaired, they are decommissioned and transferred into used. 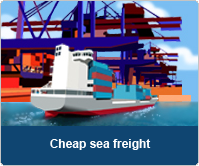 Container sea shipping is the most profitable economically. It is executed with reusable tare, called container, and protects the goods not only on board but also while multimodal transportation by any means of transport. For many carriers and cargo owners rent of new sea standard containers is more preferable than purchase. Maximum length of a sea container recommended by ISO 668:1995 is 40 feet. Port wide 45-foot container is used for most effective multimodal transportation of goods on pallets. With slightly increased width, within ISO standards, it allows downloading 25% more pallets 1200x800 mm. The amount of transported pallets with standard size 1000x1200 mm, is increased by 8%. The vast majority of goods in the inland transportation is transported on pallets 1200x800 mm or 1200x1000 mm. This is due to the need to minimize the time for loading and unloading and to provide convenient storage of goods in warehouses. Having the standard width, new sea 45-foot container does not allow using floor space with pallets effectively. The need to transport significant volumes of goods with relatively small mass, had led to the emergence of containers with significantly increased capacity on the market. Containers of 45 feet with increased height allow carrying 30% more cargo than in 40DC. Its use can increase the economic efficiency of multimodal transportations significantly. It is possible to buy a 20-ton DUOCON container for use as it is or divided into two 10-foot containers. Manufacturers of containers send united 10-foot models to customers, which is more profitable for economic reasons. After receiving the user can separate 20-foot DUOCON container and receive two containers fully meeting the ISO standards. Containers with metal removable roof are used relatively rarely because their cost is higher than of standard dry container, and they are used rarer than containers with a soft top. The main purpose of using of 20-foot containers with removable hard top (20 HT, 20ft HT, 20'Hard Top, 20 Hard Top) is multimodal transportation of heavy and oversized cargoes with maximum protection from external influences. They are designed for loading with the help of cranes or forklifts. The cost of a new 20-foot HT container only slightly exceeds the price of dry container of the same dimensions. Specialized OPEN TOP containers are designed for transportation of bulky cargo. They are well proven in multimodal transportations, but due to mechanical damage during exploitations some of them cannot be used in transportation by sea become used containers. This allows buying a used 20-foot container without roof for a relatively low price for the further use in transportations by truck and railway. Containers with refrigeration units are used for multimodal transportation of cargoes requiring maintenance of a certain temperature regime during the way. Their distinctive feature is not only an independent air conditioning unit, but also reinforced insulation of the body. Refrigerated containers allow multimodal transporting of perishable food products and various goods, which require compliance of certain temperature mode during the transportation. The sale or rent of 20-foot refrigerated containers is possible from the special container terminals with playgrounds equipped for their connection to the electrical outlets. Specialized DUOCON container with length of 40 feet allows carrying two consignments of different goods for one owner, or may be shared by the two senders for delivery to one destination. The presence of the impermeable internal wall helps to isolate transported loads. The need for multimodal transportation of oversized equipment and cargo, designed to move with the help of cranes, led to the emergence of containers with removable hard top. Despite the quite narrow scope of their application, they are used by carriers constantly. Most often 20 and 40-foot containers are available. 40-foot containers with a removable hardtop are designed for carrying of heavy and bulky loads. Their main advantage is the ability to be loaded with a crane. The price of 40-foot HARD TOP container is slightly higher than with the fixed roof, but it is justified as it allows transporting the goods, which loading is impossible or very difficult through side doors. New linear 40-foot OPEN TOP containers are intended for transportation of heavy bulky cargo, which loading should be performed with a crane. They are available in versions OT (OpenTop) with a soft top and HT (HardTop) with a hard top. The majority of them has soft canvas or synthetic material of the roof. Used sea refrigerate container of 40 feet is a good alternative to building of stationary refrigerator on processing of agricultural production enterprise or chemical plant. Strong case with corrosion-resistant coating and high-quality thermal insulation of the walls allow using it without additional equipment. New sea 40-foot containers with independent refrigeration units are gradually replacing isothermal cars used earlier. 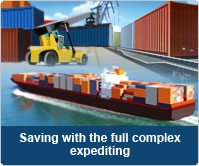 This universal tare for multimodal transportation of perishable goods and cargoes that require maintenance of a certain temperature, is used everywhere. In 40-foot refrigerated containers the cost of maintaining the preset temperature per a volume unit is minimal. Proftrans Company offers to buy new 20-foot containers with doors at both ends at the best price. Their only, but important, difference from the usual dry containers is the second front door for easy loading and unloading. This second door gave the name to this type of specialized containers - DD from DoubleDoor. The containers, equipped with two doors at the ends, allow loading and unloading operations to be much faster than having only one entrance. This kind of multi-modal containers were called DoubleDoor (DD - two doors). Conventional and high DOUBLE DOOR containers of 40 feet are well represented on the market. Sea 40DD containers after running their resource out or mechanical damage go to the category used, but this does not mean that their further use is not possible. 10-foot container is a little bit larger than 5-ton container used in previous times in Russia in railway transportation, but it differs from 5-ton container significantly with more hardness, resistance to external influences and full integrity. It is important that the capacity of 10-foot container is twice bigger (more than ten tons) with an internal volume of about 16 m3. Tank container is a multimodal specialized tare intended for moving liquids, gases and some types of bulk cargo. Generally the tanks are made of high quality stainless steel, allowing you to carry a wide range of liquid, chemically hazardous or dangerous goods, a wide range of liquefied gases and food products. Used tank containers are widely applied for multimodal transportation of liquid food products, chemicals, liquefied gases, and certain types of bulk cargoes. Structurally, they represent a tank mounted on the transport platform. As a rule, their dimensions meet the ISO requirements to containers. Given the huge range of transported cargoes, tank containers are manufactured on request in accordance with the requirements of the customer.